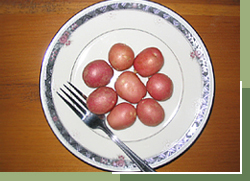 We grow approximately 15 different varieties of potatoes. Since all varieties are not ready at the same time, we have grouped them according to colour and shape. Eye-appealing red skinned potatoes. 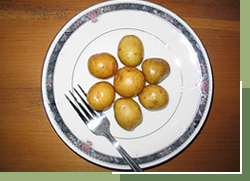 The potatoes are oval and smooth with shallow eyes. 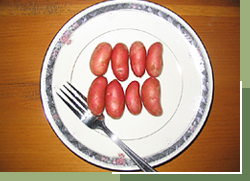 The deep red skin in contrast to the pure white or yellow flesh results in a pleaser on the dinner plate. 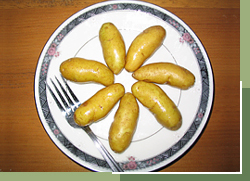 European-style yellow-fleshed potatoes recognized for wonderful flavour and dry texture. Culinary qualities are excellent. Bring out the best flavour by boiling or roasting them. Tasty potato. 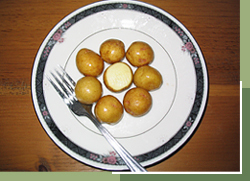 A traditional favourite of many, a round to oval bright white skin potatoes with moderately shallow eyes. The white flesh is waxy and perfect for roasting or boiling. Stunning deep-blue skinned potato, with blue flesh, almost purple. Smooth skinned, shallow eyes and excellent flavour. Makes very interesting french fries and mashed potatoes. Used in salad with the reds and whites this becomes an eye-catcher! Expect our Yellow Fingers to have the finest gourmet quality taste. The unique flavour and texture makes it an easy pick for chefs and foodies looking for that perfect yellow fingerling. Meet our favourite — the Rare Earth Red Fingers. 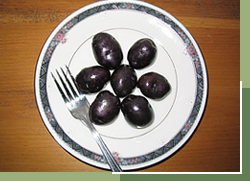 For meals requiring uniqueness in plate presentation and flavour, these fingerlings are unsurpassed. The tubers are waxy with a firm texture. We will work with you to provide your unique size requirements. Although many chefs and foodies are interested in our gourmet-size potatoes, which range from marble-size to 5/8 inch (golf ball size), other sizes are available. Contact us with your questions and requirements.